From the evolutionary point of view the skin can be seen to be a bit of a disaster. Although when unblemished it is remarkably beautiful, it is also very delicate and is easily damaged by scratches, insects, cold and by overexposure to the sun. Most animals have protection by scales, feathers, hair or particularly thick skin. We human beings have none of these and is it is difficult to understand why in terms of evolution our skin is so delicate and defenceless. It needs protection by the use of clothes. Some protection from excess sun exposure is provided by skin pigmentation and evolution has determined that the tropical zones are inhabited by people with heavily pigmented skin, with fairer skinned people living further from the equator. The skin can be viewed as a large endocrine organ. In it is synthesised a steroid compound 7-dehydrocholesterol (7-DHC). The sun converts this into Vitamin D. This is a pro-hormone which is activated in the liver and the kidneys (for further details see eBook “Vitamin D and Evolution” Medical Briefs series, Kindle and iTunes £0.99). In its activated form vitamin D has many important mechanisms. The most well-known is its vital effect on bone maturation. It is involved with the activation of immunity. It is also known to activate many of our genes. There are however several advantages from the sun that are not easily explained by vitamin D. One of these is blood pressure which is on average higher in the winter than in the summer. We can of course construct an elaborate hypothesis to involve vitamin D but this would not be particularly helpful. It is better to simply start with the sun as the hypothetical controlling factor, as the sun energy at ground level is the factor that defines the summer and the winter. The next step would be to give controlled ultraviolet radiation as a simulation of sunshine to see if it reduces blood pressure and also to whether or not blood levels of vitamin D increase as blood pressure falls. This has been undertaken by research in Edinburgh. 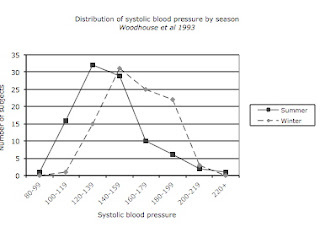 It was noted that UV radiation did indeed lower blood pressure, but the wave-length was controlled so that there was no change in vitamin D level. This means that there is more to the benefit of the sun than vitamin D, and another physiological mechanism needs to be identified. It has been known for some time that Nitric Oxide (NO) is a normal physiological mediator of arterial function (Nobel prize 1998). The research has now identified that nitric oxide is produced in the skin under the influence of ultraviolet light from the sun. It is this that appears to have the effect of lowering blood pressure. 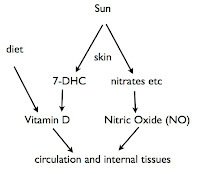 It is suggested that the sun acts on nitrates and similar nitrogen-containing compounds (from the diet) in the skin to release nitric oxide, which then has beneficial effects on the circulation. 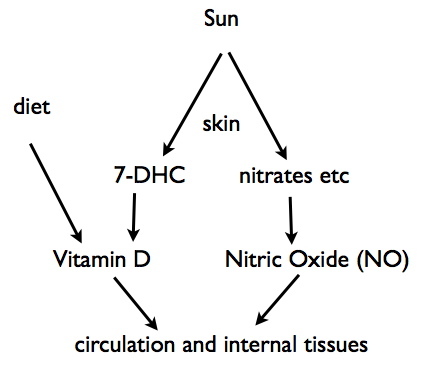 The increase of blood level of nitric oxide in the blood follows UV exposure very rapidly. There might be other beneficial effects of the sun mediated by nitric oxide and no doubt further research is under way. The practical results of this are quite profound. We find many people with severe vitamin D deficiency resulting from little or no exposure to the sun. These are mainly people who almost completely cover their skin with clothes, very orthodox Muslim and Jewish women in particular. We are giving them vitamin D supplements by mouth to correct their vitamin D deficiency, but this new research from Edinburgh suggests that this is not enough and that there is no real substitute for the effect of the sun on our skin. It means that vitamin D deficiency is in part a correctable risk factor for a variety of diseases, but is also just an index of inadequate exposure to sunlight. For further details of this research please view the TED lecture by Richard Weller. Benefits may include the impact of sunlight on daily biological rhythms (such as the one governing our sleep cycle), reducing physical stresses on the body’s cells and increasing heat production. UVA has also been shown to lower blood pressure, increase blood flow and heart rate, all of which are beneficial to the heart and blood vessels. This is probably the result of UVA causing the release of nitric oxide from skin stores, which promotes widening of blood vessels.